A huge hit during the summer, I could eat variations of this almost every day. Perfect for market/harvest season since you can include whatever your stomach tells you to buy at the market. Just steam any greens or vegetables and include them with the cold salad items. 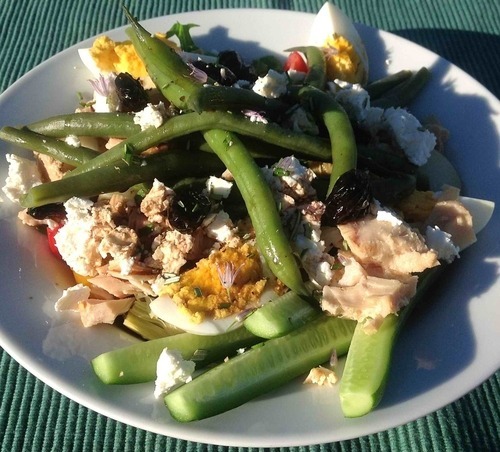 Nicoise Salad with slightly sweet Moroccan olives. This really is a very easy and versatile meal, but after writing it out, it looks complicated. Trust me, it’s not. Basically, it’s just a bowl of whatever is fresh and in season, cold or cooked, chucked in a bowl and finished with feta, herbs and dressing (oil and vinegar). There are endless variations. Got salmon? Cook it up and have a chunk of that with this instead of tuna. Don’t have feta? Grate/slice/chop some other cheese…or none at all. Don’t want potatoes? It’s great with quinoa or some cannellini beans. I haven’t found a combination that wasn’t a winner. Start by putting some halved nugget potatoes (2 to 3 per person) and beets cut into medium pieces/slices in a steamer, add some eggs (1 to 1.5 per person, depending on hunger level) to the water on the bottom and turn it on high. Make sure there’s enough water for the eggs (just less than it would take to float them). Note: I have a wonderful large steamer that sits on top of my pot, so my steaming capacity is good. I don’t know how I ever cooked without one! So, just to be clear, I’m not talking about the poxy kind of steamer that sits in the bottom of a pot, but obviously make do with whatever you have. You’ll figure it out. The eggs are done when the potatoes are (about 15 mins). Take out the eggs (with tongs or a spoon) and put them into a bowl or measuring cup and fill with cold water and set aside. Put the potatoes and beets into a bowl and set aside. If the beets aren’t quite cooked, just let them steam a few more minutes. They cook faster when they’re fresh rather than from winter storage. Add a handful of green beans (topped) and/or yu choi to the steamer and steam until just cooked (about 6 minutes). Remove from heat and remove lid. Get your bowls out (wide flat bowls, like for pasta, work best) and spread them on the counter. ….and you’re done and ready to impress your peeps with your mad cooking skills. Yo.